NAMTA encourages its members, along with visitors to NAMTA.org, to take a look into a great new resource. MITRA is a new online resource inspired by the work late NAMTA member Mark Gottsegen who had organized and implemented AMIEN - The Artist Materials Information Education Network, which eventually disappeared after Mark’s passing. MITRA is solely supported by donors, a list that includes many NAMTA members. 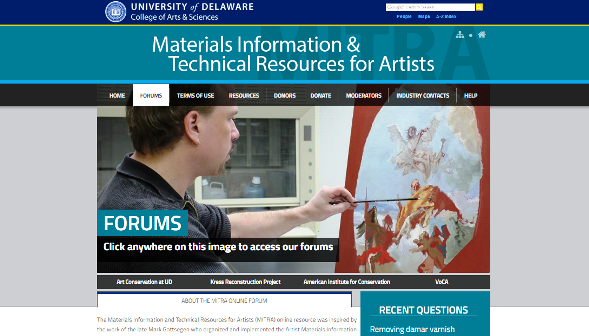 The Department of Art Conservation at the University of Delaware is an honored participant of MITRA online initiative which includes educational resources in addition to an interactive forum that will provide independent information on art materials. It is hoped that the site will serve as a guide for artists who are interested in learning about best practices as well as up-to-date scientific research on contemporary art materials and artistic techniques. Specific brands and products may be mentioned on the site, and forum relating to questions, however, no specific brands will be promoted. Any brands mentioned in the site’s resources are meant to serve as comparative examples. MITRA discusses general conservation topics such as guidance about contacting trained professionals and general tips regarding exhibition, storage, transportation, and handling, but will not recommend or describe restoration materials or techniques. The forum is first and foremost dedicated to providing the most comprehensive, up-to-date, accurate, and unbiased information about artists’ materials. MITRA is headed by Assistant Professor, conservator, and art materials expert, Brian Baade, and paintings conservator Dr. Kristin DeGhetaldi. Additionally, MITRA’s online forum is overseen by the Moderating Board, comprised of established experts in the fields of art materials, art conservation, and materials science. Finally, specific companies have generously offered to provide MITRA with technical experts should there be questions relating to specific products. At present, MITRA is primarily focused on two-dimensional fine art practices, specifically painting, drawing/sketching, and to some extent, mural painting. As the forum continues to evolve, the hope is to add other areas of artistic practice including (but not limited to), printmaking, sculpture/pottery, digital photography/design, and fiber art.